I have to say mangoes are one of my favorite fruits and for that reason I decided to cook with a few. I realized after preparing the meal that I could have added red bell peppers for color, but it goes to show that there are many different styles of cooking and less is sometimes more appealing. I do hope you will try it and please zest it up. I always wash my food, and when it comes to chicken I use lime in the process…let’s just say it was passed down *fram mi madda to mi. I believe in using the right spices (season chicken with chicken spice) to favor different meats, along with a dash of other seasonings. Therefore, after adding the seasonings, with the chicken spice being the main one, I then rubbed the spices into the chicken breast and let it sit for a few hours. I actually like to season meats and let it sit (in the refrigerator) overnight. I fried the breast in olive oil while the mango dices simmered along with green pepper, garlic, onion and seasoning to taste. While plating, the mango sauce is drizzled over the breast to create a pretty plate. So there you have it, my attempt at, um, fried chicken with mango sauce. *From my mother to me. 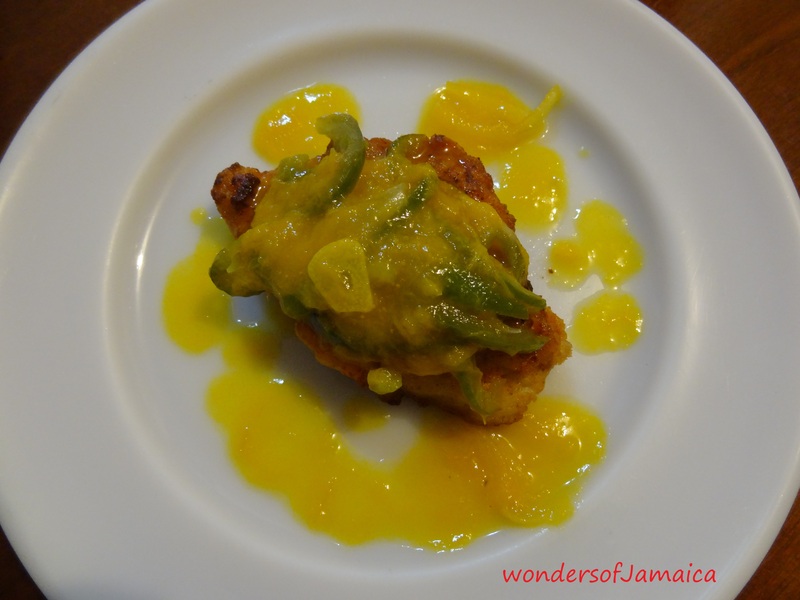 This entry was posted in Crossing cultures, Cuisines, Jamaica, Jamaican Fruits, Mangoes, Recipe and tagged Creative cooking, Fried chicken, Jamaican Fruits, mango sauce, Olive oil, Plating, Spices. Bookmark the permalink. This is a great idea.. I will try it. Letting the seasoning soak over night and washing our food is a must. Though, I must confess I don’t always do the over night thing.